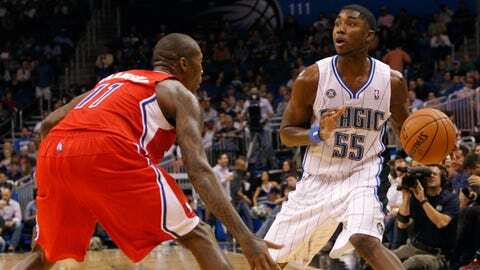 The Magic beat the Clippers in their previous meeting, when the teams met in Orlando on Nov. 6. Game time: Monday, 10:30 p.m. The Los Angeles Clippers have handily beaten some of the NBA’s top teams when Chris Paul is on the floor. Now they’ve showed how poorly they can play against a tough opponent without him. The lowly Orlando Magic don’t fit into that category, but they’ll be looking for a season sweep of the Clippers on Monday night at Staples Center after having already beaten Los Angeles when Paul was healthy. Paul separated his shoulder Friday in the third quarter of a 119-112 win at Dallas and the team announced Sunday he’ll miss up to six weeks, though he won’t need surgery. He has been the catalyst for the Clippers (23-13), averaging 11.2 assists against 2.4 turnovers with 2.5 steals to spark an offense that has hovered around the NBA’s top five in scoring all season. His absence was glaring in Saturday’s 116-92 loss at San Antonio. The setback was a near-exact reversal of Los Angeles’ 115-92 home win over the Spurs on Dec. 16. Paul had 23 points, eight rebounds, seven assists and four steals in that game. In Saturday’s loss, the Clippers had no outside touch, matching a season worst with 20.0 percent shooting from 3-point range (3 for 15), and had at least 18 turnovers for only the third time in their last 22 games. They fell to 1-1 this season without Paul, who also sat out with a strained hamstring at Sacramento on Nov. 29 – a 104-98 overtime victory for the Clippers. Jamal Crawford scored 24 points against the Spurs, Blake Griffin had 19 and Darren Collison added 14 points and six assists starting in place of Paul. "No one has to replace Chris’ anything," Griffin said. "Not his voice, not his game, nothing. Everybody does things differently." Los Angeles gave up 70 points in the opening half against both the Mavericks and Spurs. The difference is that with Paul they trailed by three at the break Friday but were down 35 at halftime Saturday. "It’ll work just fine," Griffin added. "That would be our biggest mistake, is to try to replace him with someone or something." The good news for the Clippers is that nine of their remaining 13 opponents in January are currently below .500. The bad news is their suspect defense will likely be exposed without Paul. They are allowing 100.1 points per game this season and are 1-8 when they fail to reach triple digits. One of those eight was a 98-90 loss at Orlando on Nov. 6 in which Los Angeles was outscored 44-30 in the paint and allowed center Nik Vucevic to dominate with 30 points and 21 rebounds. The Magic (10-23) come in riding a three-game losing streak as they open a five-game trip that also takes them to Portland, Sacramento, Denver and Dallas. After winning two of its first three games against the Western Conference this season, Orlando has dropped nine straight. Vucevic may not be a problem for the Clippers this time after he missed his second straight game with an ankle sprain in Orlando’s 110-94 home loss to Miami on Saturday. Jameer Nelson scored 21 and Tobias Harris added 17 points and 10 rebounds for the Magic. Arron Afflalo, leading the team with 21.2 points per game, had 16 on 5-of-16 shooting to drop his field-goal percentage during the losing streak to 34.7. "It’s getting back to that point again, we just want to win," Afflalo said. "Regardless of any and everything, each and every night, whether it’s this or that – we just want to win."